Most coaching programs are a combination of student-centered, teacher-centered, and relationship-driven coaching. The approach that a school takes often depends on their philosophy about how to improve teaching and learning. It also may depend on the school culture and relationships that a coach has with teachers. It isn’t uncommon for coaches to engage in all three types of coaching in a single school—or even in a single day. But if schools want to be able to explicitly measure the impact of coaching efforts on student achievement, then coaching must be rooted in the standards and in measuring student progress toward learning objectives. 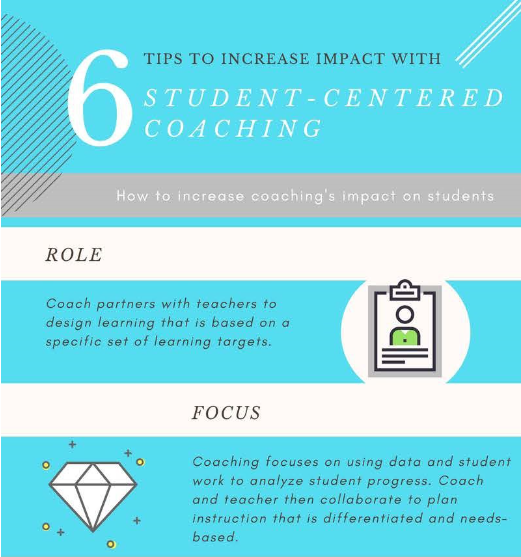 This tip-sheet presents six tips for increasing the impact of coaching on student results through student-centered coaching practices.